The Gardner 6LXB engines are in good condition and have been maintained to a professional level through out their lives. They drive the 2 inch stainless steel shafts through a PRM 601 Gearbox. Bespoke design contoured twin fish shaped rudders. Dual 12 volt and 24 volt electrical systems are fitted - powered by 2 12 volt batteries and 3 24 volt batteries. The electrical Generator is a Kobuto 12KW 220V unit. The Eberspacher diesel heating system runs 9 radiators through out the boat. Built by Monvoran Seacraft this sturdily built vessel is built of 5mm steel around the bilge on 500mm L frames. The exterior has been painted with AWL GRIP (2013) and the interior is coated with 12 coats of coal tar. She is sprayed with 70 mm flame retardant foam throughout. She also has stainless steel bow, fairleads. scuppers and thresholds. The yacht has informal seating area for approx 8 around the large table in the Upper Deck Pilot Salooon which is located aft of the bridge. Below she has a largemaster suite aft which included a double cabin, ensuite heads, ensuite shower and walk in wardrobe. The are a further two double cabins, one located on the forepeak with its own shower and hanging area. The sizeable galley adjoins a lower seating area with seating for 8 around a saloon table. There is also a "day" heads with large shower area. All the accommodation area is finsihed in highly polished mahogany. This substantial yacht was built to a high spec by Monvoran Seacraft in Falmouth and commissioned by the current owner in 1995 as a luxurious long distance live-aboard cruising yacht combined with the strength associated with commercial trawlers. She has facilities to accommodate six without any risk of feeling crowded below. This is a go anywhere yacht that, with a few minor upgrades, would be capable of turing heads in most ports throughout the world. 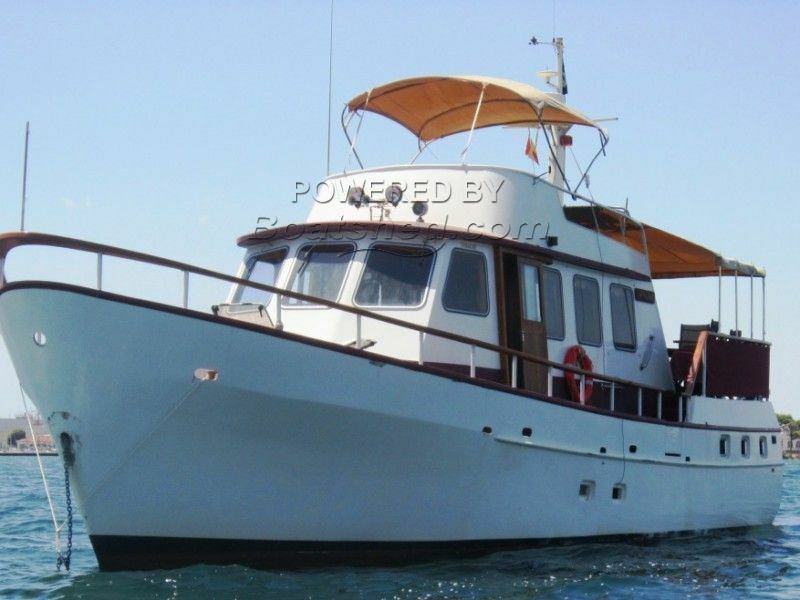 Capable of being used as a "live-aboard" immediately, the owner would consider including some time on her current mooring in the price. This Monvoran Seacraft Trawler has been personally photographed and viewed by Chris Fuller of Boatshed Falmouth. Click here for contact details.